The presiding deity of Lord Srinivasa, festival deities and other deities are exquisitely decorated with floral and tulasi garlands during this seva. 'Thomala' denotes the decoration of the deities with garlands. The grihasthas who have paid the requisite amount can have darsan of the Lord during Thomala seva. 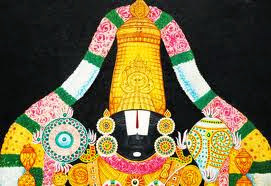 However, the priests decorate the main deity of Lord Venkateswara with flowers brought by Ekangi or flowe specially brought from Flower room by Jeeyangar. The seva is performed for 30 minutes. This seva in conducted as arjita seva on Tuesday, Wednesday and Thursday. It is held in ekantams during the rest of the week.